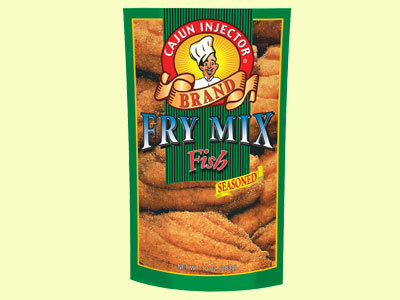 The Cajun Injector brand is a division of Bruce foods. Cajun Injector produces a wide range of Cajun inspired products from injections and marinades to seasonings and fry mixes. Since their creation in 1977, Cajun Injector products have become some of the most recognizable and widely sold Cajun products in the United States. I tried out some of Cajun Injector's Fish Fry Mix on some white fish fillets earlier in the week. Cajun Injector's Fry Mix is a cornmeal and flour blend that is seasoned with salt and a variety of other spices. It's also infused with real lemon flavoring. The lemon aroma was incredibly strong when I opened the package, but the flavor was surprisingly subdued. In fact, all the ingredients in the Fry Mix blended to make a very mild flavored breading. It wasn't overly salty as some packaged fry mixes tend to be. The fry mix coated the fish easily and browned up very well. It formed a light crust on the fish that held together well, but flaked nicely when broken up with a fork. The flour / cornmeal ratio was in just the right balance as to not make the fish too crunchy. Cajun Injector's Fish Fry Mix is a good all purpose fry mix. It worked well for white fish and could be very nice on chicken or vegetables as well. The great thing about a mild fry mix is that you can customize it to your liking by adding the spices of your choice. To learn more about the Cajun Injector brand, click the title of this review. See how their Fish Fry Mix rates on the "Product Reviews" page. 1 Response to "Cajun Injector Fish Fry Mix"
It is seasonded just enough.